Bid caching is still echoing in the adtech industry and we’re determined to unveil all the facts and figures related to the topic. As an initial step, we explained how to cache your bids in the right way (Think Topix). However, we haven’t covered the impact of bid caching. Thanks to Jounce Media research, we are now able to see the impact of bid caching on Index Exchange clearly. Index Exchange has been winning 50% more impressions with the help of bid caching. In other words, 50% of all impressions filled by Index Exchange is due to bid caching. The research started monitoring 1.7 million impressions delivered across the mix of ComScore Top 1000 publishers. Of all the nine exchange (App Nexus, BidSwitch, Index Exchange, Google Ad Manager, Oath, OpenX, PubMatic, Rubicon Project, and Sovrn) included in the test, Index Exchange is the only one which depicted the signs of bid caching. The research did not include other aspects such as page load time, eCPM rates, and ad viewability. Takeaway: The influence of bid caching on auctions seems to be severe. 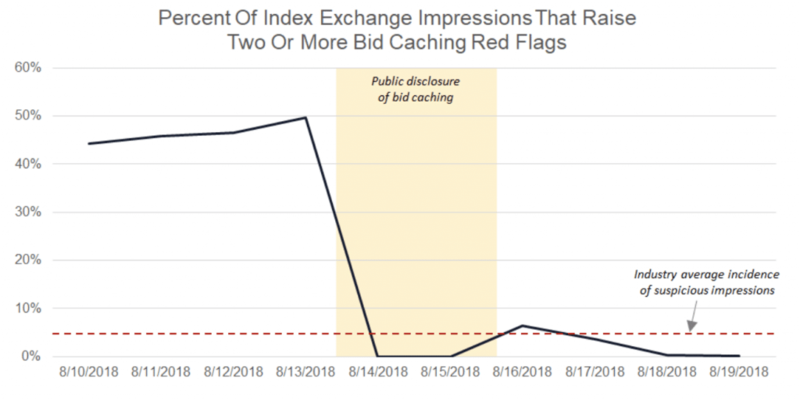 Another source shows that the impressions delivered by Index Exchange have dropped significantly after the Exchange disabled the bid caching technique. We believe the problem is not with the technique, but with the adaptability rate. Remember how we started to refresh ads? Google’s Accelerated Mobile Page (AMP) format launched in 2016, created a buzz among the publishers. As with everything else by Google, publishers have flocked towards AMP format to prevent their SERP ranks and organic traffic. At first, it seems to be beneficial for publishers. 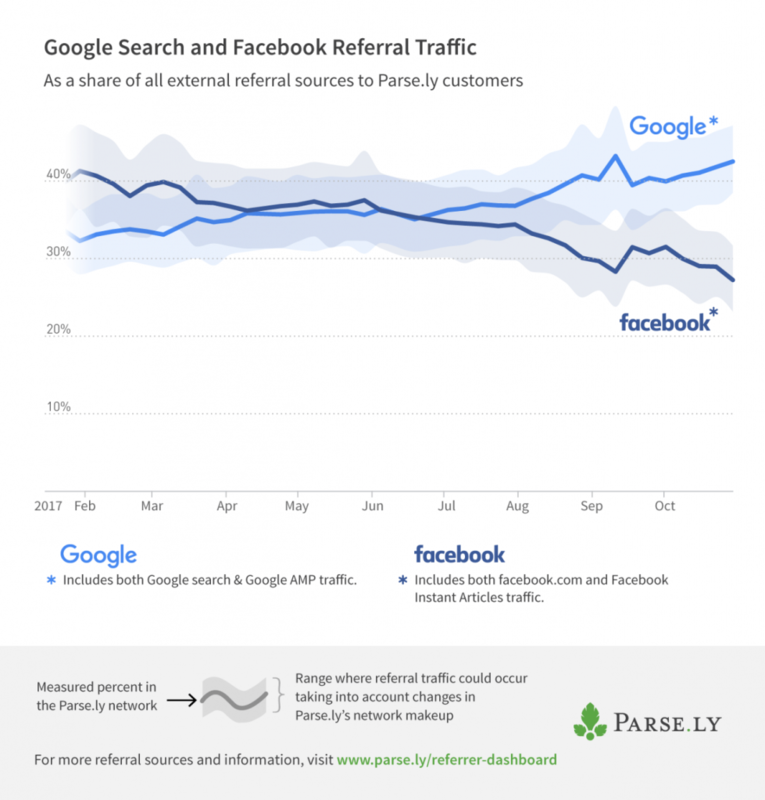 Parse.ly, a data analytics firm reported that the referral traffic from AMP has overtaken the Facebook referral traffic. Here’s the math publishers did while implementing the AMP pages. Traffic boost and increased page views will be able to beat (or at least compensate) the ad revenue lost by AMP. ICYDK: AMP pages only support certain ad formats and this results in decreased ad revenue for publishers. Apparently, the math was wrong. Chartbeat shows that only 1 in 3 publishers clearly sees the traffic boost from AMP. 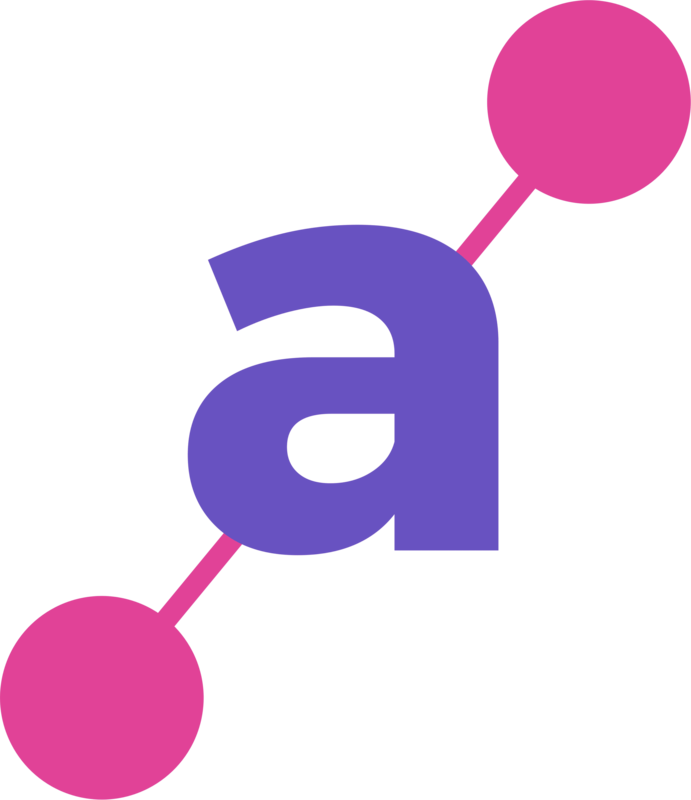 “In sum, the prospect of AMP may not be positive for all publishers,” Chris Breaux, director of data science at Chartbeat. The study conducted by Charbeat analyzed the traffic across 150+ publishers to see the impact of AMP pages. Surprisingly, most of the publishers said they’re not sure about the AMP referral traffic. But, they are about the decreased ad revenue. Takeaway: If AMP isn’t able to deliver the traffic boost as promised, publishers might be losing ad revenue by implementing the format. As a publisher, it is up to you to determine what’s best for you. Agreed, it isn’t easy to wipe the format off completely like The Daily Beast. We advise you to consider the volume of users and ad revenue on AMP pages to make an informed decision. Without a doubt, GDPR has created quite a fuss. And, we are still looking at publishers concerned about the law and the consent mechanisms involved in the chain. Last week, we found an interesting GDPR chart from Digiday. The chart is about the rise of contextual targeting. 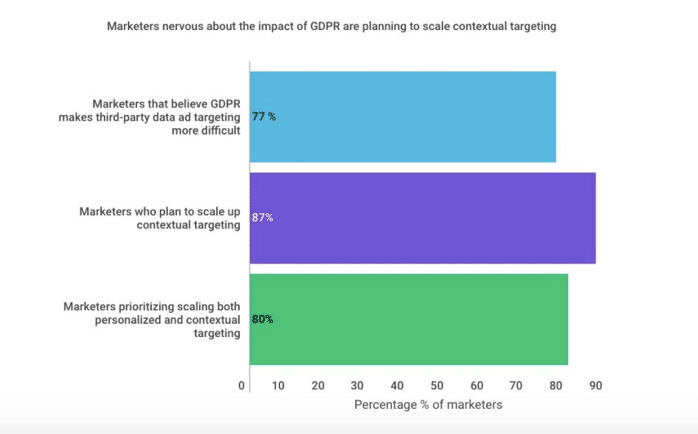 Almost 80 percent of 500 brand marketers across Europe and the US says that it will harder for them to target audiences using third-party data because of GDPR law. However, contextual targeting can be used to fill the gap. “87 percent of marketers said they plan to increase contextual targeting in the next 12 months” while maintaining personalized advertising where possible. Takeaway: This makes sense. If you’re a publisher with considerable EU users, you might have experienced the conflict between the third-parties and GDPR before. There are only two possible ways to address the issue – Partnering with GDPR-ready third-parties and Audience Segmentation (to get direct deals). As per the latest Forrester Video Advertising Forecast, advertisers will spend a whopping $103 billion on video advertising by 2023. And, by the end of 2018, video ads will cost the advertisers $91 billion. The report correlates with our recent insight where we predicted the video ads will attract more advertisers than any other formats. Gen Z-ers spend 4.3 hours a week streaming content, according to MNI Targeted Media. If you follow our blog, you know we always advise publishers to keep up with the readers. If the consumer behavior is changing, it’s time for you to change. Two-thirds of viewers don’t mind watching video ads to access free content. 72 Percent of the surveyed users preferred watching TV shows with ads immediately rather than waiting for an ad-free version. 194 Million people are streaming ad-supported, free online videos this year. Takeaway: As you could see, this is the right time to run video ads on your site. That said, it is important to assess your readers’ interest and behavior before implementing any solution across the site.